In both the book and movie versions of Lord of the Rings, there are 19 rings (7 for the dwarf lords, 3 for the elves, and 9 for men) that are controlled by "one ring to rule them all." The battle of the story centers around the current owner of the ring, Frodo, who must destroy the ring in order to keep it from the dark lord Sauron. Several years ago, my organization and planning skills felt like I was wearing all of those rings. I had a daily task sheet that I maintained at work, a computer-based work calendar (Outlook), a separate calendar for personal events, and my cell phone for contacts. Unless I was sitting at my computer, I was unable to know when I had meetings or appointments. It was during this time that I had the opportunity to attend a FranklinCovey class titled "Focus - Achieving Your Highest Priorities." The course materials featured an integrated planner that include space for event, notes, contacts, and tasks. After using this for a brief period of time, I began using a wire-bound planner and supplementing it with a separate notebook for notes. My current journal, which I started on 6/4/2011, contains notes from meetings, summaries from books I have read, stories and anecdotes that I can use for later presentations or talks. The photo above is of my notes from My Story Can Beat Up Your Story. 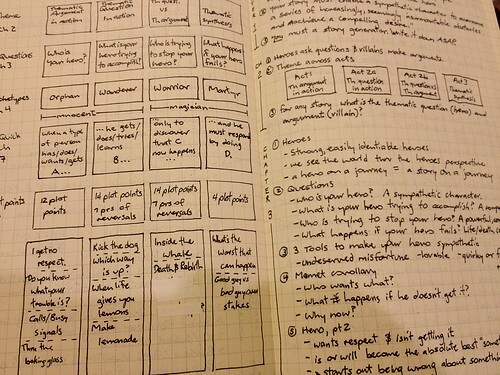 If you do not keep a notebook now for your ideas, notes, and reminders, I encourage you to start. You will benefit from having a record to review. Moleskine journals are excellent for writing and drawing and come in a variety of sizes and configurations. In my next post I'll share a recent discovery that inspired me to change how I use my notebook.